Installing a swimming pool in your backyard or commercial property is always a good investment. It will help improve the functionality, aesthetics, and market value of your property. It can also become a perfect spot for rest and relaxation for your family and friends. But you can enjoy these benefits only if you hire a well-experienced pool contractor like us at Nolascapes Pool & Outdoors LLC. Our portfolio includes installation of custom-designed pools for numerous clients in New Orleans and other Southeast Louisiana areas. With us, you can have your dream swimming pool at a cost that won't harm your pockets. Please dial (504) 250-3910 today and let us talk about your plans, budget allocation, and desired pool features and amenities. There are a lot of swimming pool contractors in the state but not all can provide topnotch services. If you want to be assured of an excellently built pool, you should hire a reputable contractor like us. Clients trust us because we can create unique pool designs, build durable structures, and design low-maintenance pools. You are also dealing with a legitimate pool contractor since we are licensed, bonded, and insured. The different types of pools that we have built for our residential and commercial clients include fiberglass, vinyl liner, and concrete pools. Our ability to create exquisitely designed pools is one of the reasons why a lot of homeowners choose our services. Our creative design team uses modern pool design techniques to make your new outdoor living space a standout in your neighborhood. Moreover, our pool designer knows how to make eye-catching pool designs even if you have a limited budget or small outdoor area. As a professional pool installer, we have the needed resources to build any pool type that our client may desire. We have the right tools and equipment for above ground and in-ground pool installation. Our heavy duty equipment and other specialized tools help us fast track the completion of every project that we handle. Our objective is to finish your pool on time or even ahead of schedule. As a versatile pool contractor, we can install fiberglass units and conventional pools made from concrete. The installation of your pool is handled by expert people so you are assured of quality workmanship. A pool project should be handled by a professional pool contractor. However, choosing the right pool contractor is not an easy task because of the sheer number of service providers in New Orleans in surrounding areas. You have to compare the rates, terms, and credentials of the local companies offering pool design and installation services. But why opt for the tedious process if you can just hire Nolascapes Pool & Outdoors LLC. We beat the competition by offering client-friendly rates, flexible terms, and highly customized services. Pool installation is a major property improvement project, so you have to ask the right questions before you allow your pool contractor to proceed with the installation. 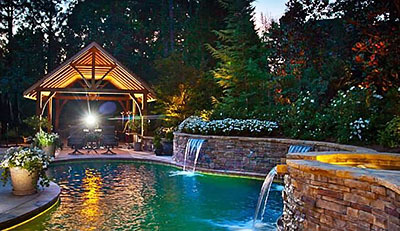 At Nolascapes Pool & Outdoors LLC, we encourage open communication with our clients to ensure a hassle-free installation. It is our policy to discuss with you the details of your project, particularly the style, recommended pool amenities, and cost estimate. If you need our assistance in designing and installing your dream pool, please call our hotline and our friendly staff will gladly assist you.